This cable is typically used to connect AC 240 Volt power from a Power outlet to two Monitors. 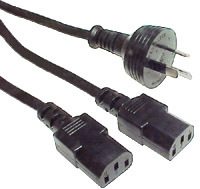 A Monitor with a female IEC power connection. A PC with a male IEC power connection.